Could you live in a shipping container? More architects and developers are repurposing sea containers into homes. But don't worry; it's not as small as it sounds. WASHINGTON — In Travis Price’s dream world, he would build a floating village — “just like Sausalito” — over Washington’s waterfront. Only his floating village would be constructed out of repurposed shipping containers. 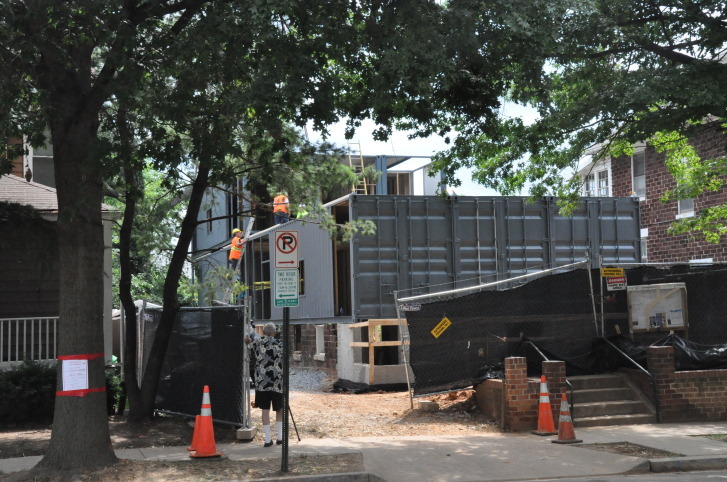 Price, a D.C. architect, also imagines mobile shipping container apartments, stacked in steel frame buildings. “And then when you move from Chicago to Mississippi, there’s another 10-story. And you rise up [your condo] on an exterior elevator, plug in and you bring your home with you,” Price says. Price isn’t asking people to live in small, dark, enclosed colored boxes that slide up and down gray, industrial buildings. Rather, he envisions homeowners and developers repurposing materials that are overabundant, and finding ways for them to fit into a home’s design — like shipping containers. “There are over 700,000 sea containers sitting foul, going nowhere in the U.S. Remember, we imported all the stuff. All of your iPhones came in those containers, but we’re not sending anything back,” he says. In his eyes, D.C. is already moving forward. Price is the architect behind an apartment project that is generating a lot of buzz in the Northeast neighborhood of Brookland. It’s a four-story, 24- occupant development, made from 18 repurposed shipping containers, plus a basement. Price pitched the building’s design this past spring when Catholic University graduates Sean Joiner and Matthew Grace came to Price for help rebuilding a property they purchased and knocked down. “Their first response was, ‘No way.’ And then after about a half-hour, it was, ‘All the way,'” Price says about Joiner and Grace’s reaction to the repurposed sea-container design. “We whipped out drawings and got all the permits, which is never easy in D.C.,” Price says. The façade of the building is different from the neighborhood’s traditional bungalows and Victorians, but its interior layout is conducive to the area’s college population (it’s located on 7th Street NE, just a few blocks from Catholic University) and the influx of modern millennial-attracting apartments (Monroe Street Market is the area’s large-scale mixed-use development). It’s designed as “shared housing.” Each floor has a large common area with a living room and a kitchen, plus six 240-square-foot bedrooms, each with its own bathroom and study. “We’re doing all wood inside, these beautiful common spaces, tremendous windows — like 9 ft. by 8 ft. of solid glass,” Price says. How does this work with shipping containers? Price explains six containers constitute a floor of the building, and they are lined up in two rows of three. The inside walls of the containers are cut out to create the open common room; the ends of the containers constitute the bedrooms and bathrooms. Price says the containers are largely held up by their four corners. Price says the sea container apartments, which are called Sea UA — a play on CUA, short for Catholic University of America — are insulated, wired and decorated on the inside just as other apartments are. And there is no need to worry about leaks. “They [were built to] go across the ocean,” Price says. The cost, however, is lower than traditional construction. “We’re coming in, construction-wise, almost half of conventional construction,” says Price, who says the building’s owners will release the final budget when the project is complete in a month or so. All of the apartments are leased, and residents are expected to move in come September. In addition to making sense economically and ecologically, Price says using the repurposed containers also helps build the neighborhood’s story and its character. D.C. is already home to two other notable buildings made from sea containers, including El Rey, the Mexican beer garden on U Street, and Half Street Fairgrounds near Nationals Park. Price predicts it’s just the beginning for the shipping containers’ role in real estate. Price understands initial skepticism, mostly because people don’t associate shipping containers with homes; the mental image of a shipyard is ingrained in the minds of many. “They say, ‘Oh, sea containers, well I’ve seen those sitting out by the shipyard. How can that be?’ And then they start to actually look at it from a different set of eyes,” he says, pointing out that the first Gothic churches were initially despised in Europe; now they are revered. He’s hoping that same change of mind will come for those hesitant to embrace this new form of architecture.